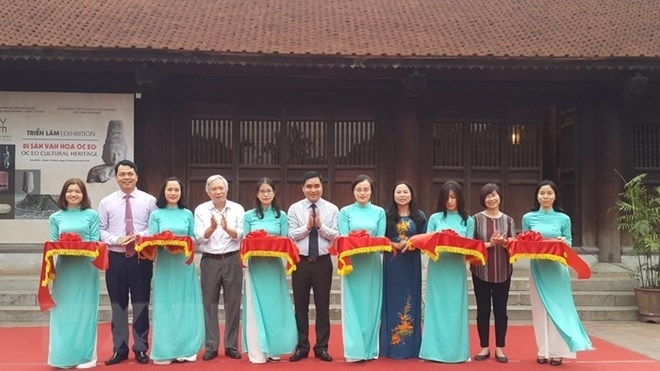 More than 140 photos and objects of the ancient Oc Eo culture are being displayed at Van Mieu-Quoc Tu Giam (Temple of Literature-National University) in Hanoi. 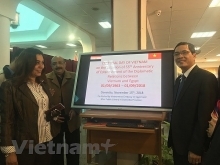 The event was jointly held by Centre for Scientific and Cultural Activities of Van Mieu – Quoc Tu Giam and the An Giang province Museum. Flourishing between the second and the seventh century, the Phu Nam Kingdom covered a large area of the southern plain and hosted the Oc Eo culture in An Giang province. After being forgotten and buried for thousands of years, traces of the Oc Eo culture were discovered in Ba The – Oc Eo area in the Mekong Delta province of An Giang. In 1944, French archaeologist Louis Mallecet carried out excavations at the site, along with his colleagues from the French School of the Far East. They unearthed objects offering proof of a flourishing civilization and well-developed trade with other areas in Southeast Asia. People in the civilization produced many handicrafts, including ceramics, as well as had the ability to refine copper, iron and tin, along with creating silver and gold jewellery. The exhibition takes place from April 24 to May 24.